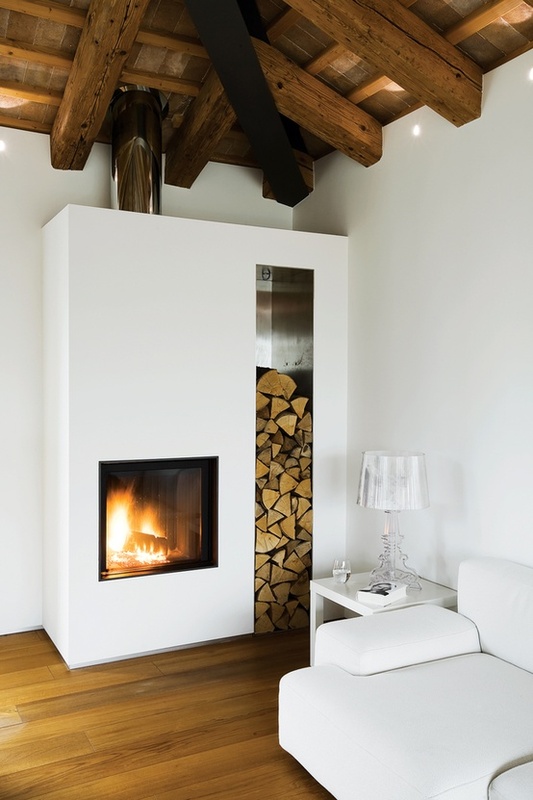 The plan to have a fire is more for the aesthetic than the heating potential. Although, being a low thermal mass building with renewable heating sources (heat exchange water heating and solar PV) that will be slow but consistent in providing heat, it will be good to have an effective quick way of heating the building. The fire is to be a log or multi fuel burner on the east wall of the lounge. See floor plan etc. below. The whole house will have an MVHR system and the downstairs is open plan to the kitchen that will have an extractor over the cooking area. See comments on this below. Automatic log burner control ? The house is going to have an MVHR system, that should auto balance the cooking extractor fan. An MVHR system means the fire is being built to have an air pressure test result of below 1.0 (including the fire). So the fire needs to be well installed and room sealed (so that the fire draws it’s air supply in from outside, directly to the stove). What about when open the fire door to fuel it ? Would it help to convert the extractor to a balanced system (i.e. supply and extract both in kitchen – possibly with heat recovery)? – would this auto be the case to the MVHR system ? Full plans for the house and other full sketches etc. can be seen on the Approved Proposal page. 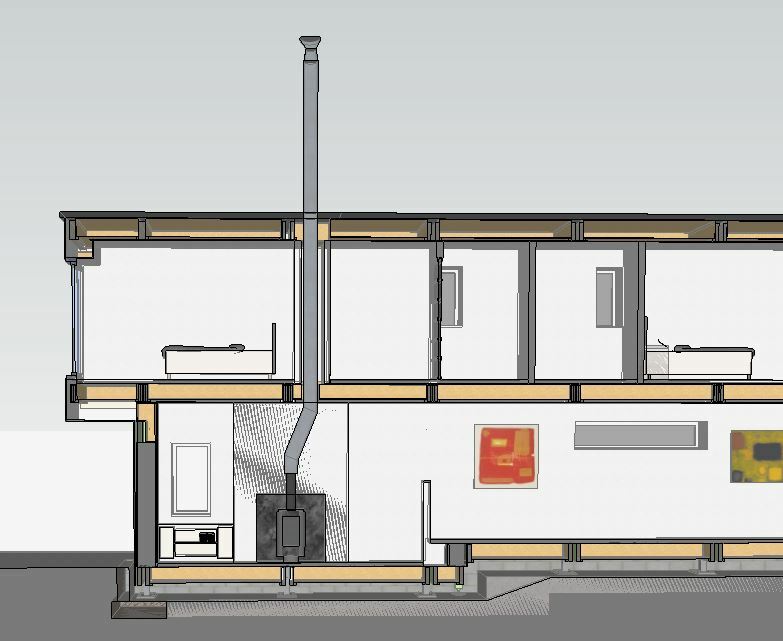 I’ve put below some cross sections from the Sketchup Model to show how the flue needs to kink to the left, so that the fire can be centrally placed and the flue travel up through a solid section of wall in the bedroom above, before exiting the roof by the top floor home office / study. The idea of what type of fire has evolved to an inbuilt fire, surrounded by a fire breast that looks like it is made from a solid stack of slate. The slate is to be the same as the slate flooring on the upper area of the first floor. 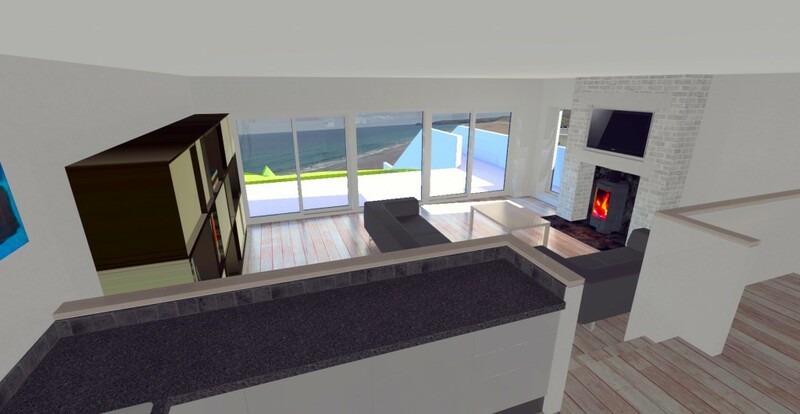 I want the area around the fire to include the TV and log storage. The slate fire surround should help camouflage the TV when it is not on. 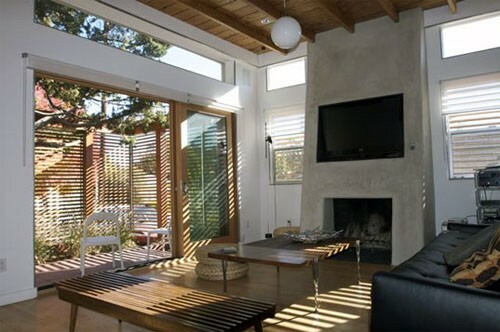 The organic nature of a wood store as a part of, or next to the fire surround should compliment the organic feel and rough texture of this area of the downstairs living area. 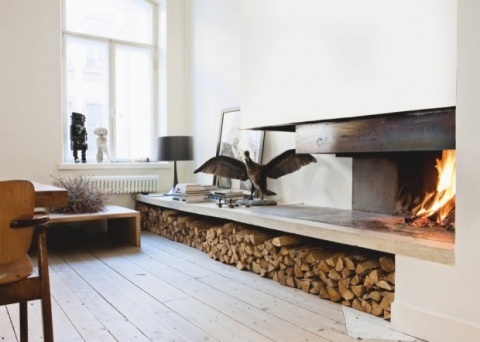 – I’m very happy for alternative suggestions on how to layout the fire, woodstore and TV. Fire surround could be hollow with vents at the bottom and top to allow air circulation around the burner within the fire breast. An insert for the TV, so that it sits back from hot air moving up the face of the fire breast. The TV will need power and TV signal cables (video and audio). The fire can be low to the floor, so it’s more akin to an open fire. This will keep the TV not too high. Slate on the floor in front of the fire. The log store can be a part of the fire breast or not. 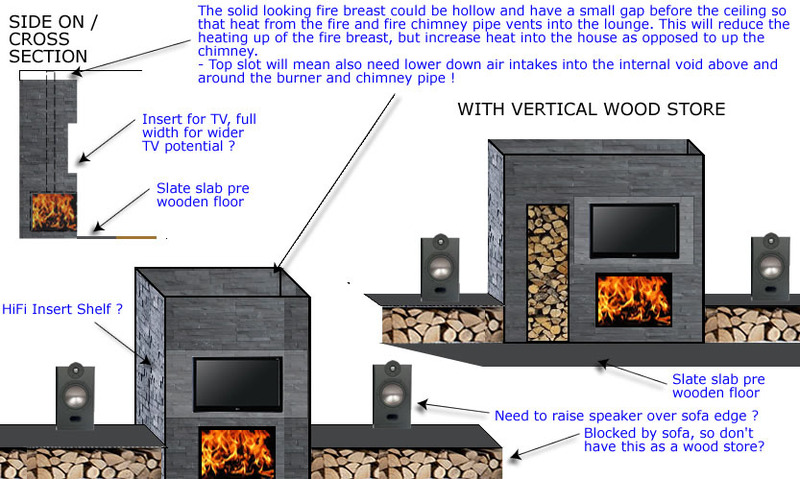 I’m very happy for alternative suggestions on how to layout the fire, woodstore and TV. 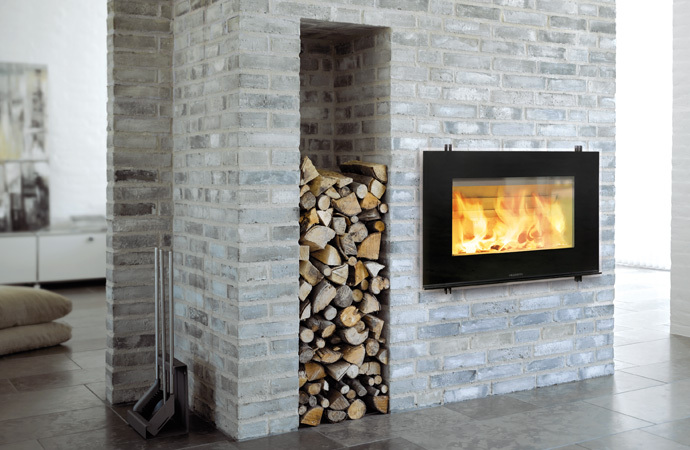 Thin depth so that the fire surround can be thin (minimum stick out into the room). Below 5 kW so that it can be room sealed. Self cleaning glass if possible. 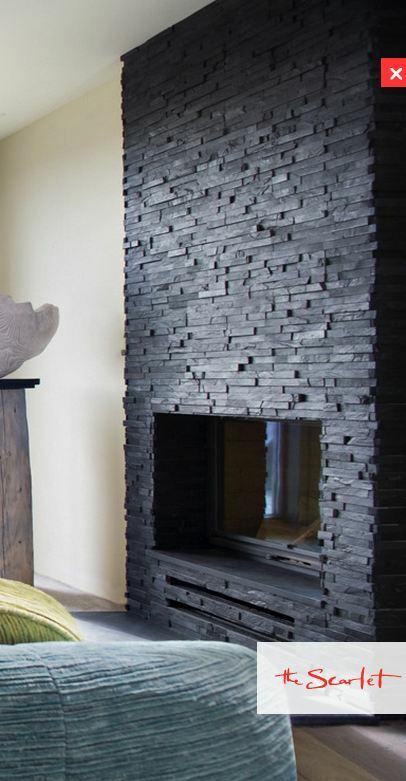 Slate fire surround (although prefer the above Scarlet Hotel slate edges). 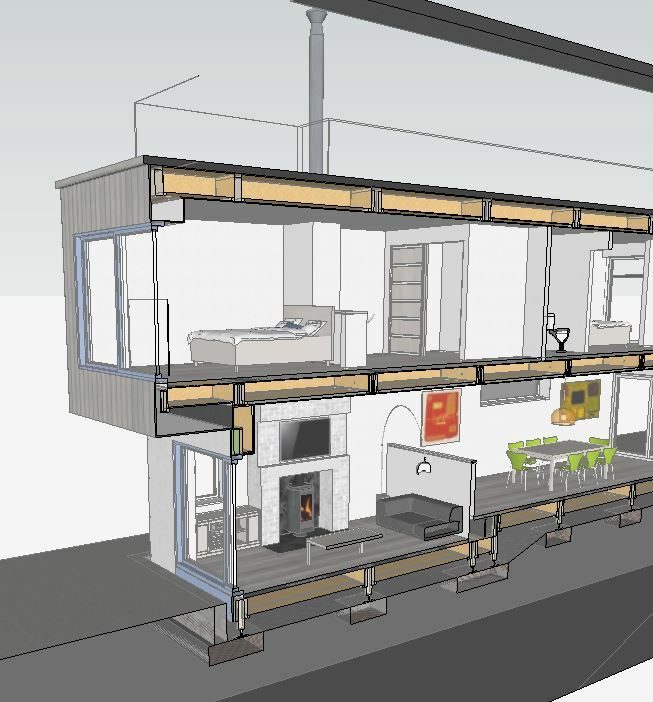 Below are cross sections from the Sketchup Model to show how the flue needs to kink to the left, so that the fire can be centrally placed and the flue travel up through a solid section of wall in the bedroom above, before exiting the roof by the top floor home office / study. 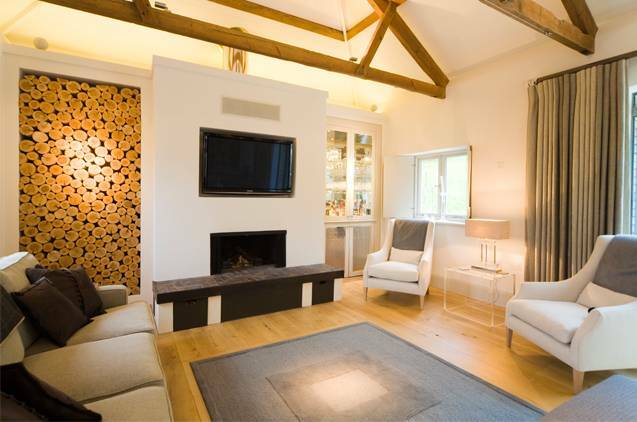 – it could be that alternative suggestions come in to perhaps put the fire next to the TV, so the fire flue goes straight up and neither the fire or the TV are centralised on this section of the lounge wall.